The Ultimate Cinnamon Pancakes – double filled cinnamon streusel pancakes! This copycat “Recess Time” pancake from the famous The Griddle Cafe in L.A. as close as I could get to the real thing, and I have to say, it was pretty awesome! Perfect for a special occasion breakfast. When we went to California in November, we spent a day eating our way through Los Angeles with our good friend, Amanda, from Kevin and Amanda. Amanda had a long list of food places for us to try. We started our food feast at The Griddle Cafe in Hollywood. Amanda recommended the “Recess Time” pancake, which is a double-filled cinnamon streusel pancake. We took her advice and ordered the pancake and I am so glad we did! It is the BEST pancake I have ever tasted in my life. Josh and I recently recreated our favorite cinnamon streusel pancakes at home and we are sharing the recipe today. The pancakes at The Griddle Cafe are humongous! They are as big as the plate and stacked three pancakes high. Luckily, they will let you order a single pancake-which was big enough to feed all three of us. Ok, so maybe we ordered French Toast too, but we were on vacation, we had to splurge:) The pancakes are served with a big scoop of whipped butter and pure maple syrup. 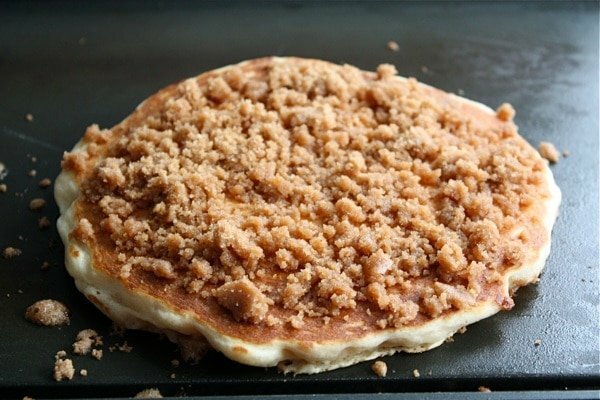 The cinnamon streusel provides a nice, sweet crust on top of the pancake. These pancakes are out of this world! We were determined to recreate our favorite pancakes at home so one morning we put our game faces on and got to work. We started with a light and fluffy buttermilk pancake recipe. We also mixed up a bowl of cinnamon streusel. We made large pancakes, maybe not quite as big as The Griddle Cafe’s, but plenty big if you ask me! We added a sprinkle of cinnamon streusel to the first side of the pancake. After we flipped the pancakes, we loaded on the cinnamon streusel and I mean loaded. The final side of the pancake needs to be heaping with cinnamon streusel. While it is heating up the cinnamon streusel will slightly harden, creating a crispy sweet crust. Josh let a big scoop of butter melt all over the pancake, making the pancake even more decadent. We both tasted the pancake and looked at each other. We both smiled and started nodding. We nailed the recipe. Our cinnamon streusel pancakes tasted just like the “Recess Time” pancake we devoured at The Griddle Cafe in L.A. We were so happy we recreated one of our favorite recipes! Now, we can eat cinnamon streusel pancakes without leaving our home. Breakfast is so much better in your pj’s. I will warn you these pancakes are insanely sweet. We said they were a once of year kind of treat, but Josh is already asking for them again:) We will see how long that rule lasts:) Make them for a special occasion or when you are in a sugary mood. These cinnamon streusel pancakes are hands down our favorite breakfast treat. To see what else we ate in L.A, check out Amanda’s post. We had SO much fun. Thanks, Amanda for being our fabulous tour guide. And if you are ever in L.A, I highly recommend you visit The Griddle Cafe. It will knock your socks off! Light and fluffy buttermilk pancakes with sweet cinnamon streusel topping! These are our favorite pancakes. BRILLIANT. Coffee cake and pancakes together! yum! These look like the best pancakes EVER. I love cinnamon streusel! This pancake looks like heaven! How is it that I live in LA and have never been to the Griddle Cafe? I will have to remedy that soon. I saw that you went to Joan’s on Third, Magnolia’s and Scoops when you were out here though, I love those places! You HAVE to go to Griddle Cafe, it is SO good! We went on a food tour and had so much fun. I hope to come back so I can eat some more. It would be fun to meet up with you too! I have never seen pancakes with stresel on top! Love it!! One thing I miss living in France are great breakfast joints and those great All-American diner breakfast specialities. Mmmm streusel topping is always great but what a way to add decadence to pancakes! OOOh those look delicious…I could have one of those easily…or maybe even two! These pancakes look perfect!! Sign me up! wow, drooling. Those could be the best pancakes I’ve ever seen, woohoo! WOW WOW WOW WOW These look SOOOOOO delicious!!! What a great way to kick off the weekend! These would be such a treat and I have a feeling we would find it difficult to only eat them once a year. oh man these look too good and too easy to pass up! Im going to have to make these real soon! Oh my goodness – I’m a streusel lover and these look AMAZING!! Wahoo! My little cowboys are gonna love these! Pancakes are always the top of the list for breakfast at our house and I’ve never seen any like this, we will have to try them! When I read Amanda’s recap, I remember seeing your comment to her about the panckes, and I remember thinking, I hope Maria does make them! Glad you did. 🙂 They look incredible! What a decadent pancake! I can’t wait to try it! yum!!! These remind me of the caramelized cinnamon waffles at Bruges in Salt Lake. Have you been there? They are amazing!!! I love pancakes, these look perfect for a special occasion or a sweet-toothed Sunday. These are genius. 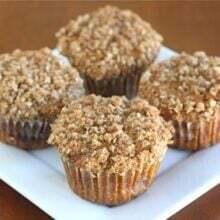 I love the streusel top on muffins; I could eat that alone. Now you really can when they’re on pancakes! These look amazing, Maria! My hubby is the pancake master…I’ll have to get him to make these for us. I was actually think of putting some streusel topping on top of my boyfriend’s pancakes this mornng. Now I have to do this next time. What a treat! Oh my goodness!! Good thing my kids weren’t around when this came on my screen!! I’ll be holding onto this recipe for when I am big trouble with the boys… should get me on their good side and then some!! I almost made pancakes yesterday and didn’t because I couldn’t think of how to make them more special (I was in need of a grocery store trip). I NEED to make these. I absolutely love cinnamon strussel. Thanks for the recipe! Oh goodness does that look heavenly!!!! Sounds just like my type of breakfast, cinnabon meets fluffy pancake. Wow! Now that is my kind of breakfast. Thanks for sharing this yummy and simple recipe! Already counting down to next weekend so I can make these! Holy yum that looks awesome! What a fan-freaking-tastic idea! These look fantastic! Breakfast foods are my favorite, I cant wait to give these a try! These have left me speechless (I’m actually quite giddy about these…I’m fighting the urge to jump up and down giggling like a fool!)! I can hardly wait for the weekend so I can make these for breakfast!! Thank you so much! These look…amazing! The flavors would totally rock…steussel. I make streuessel muffins and love any variety of it! Oh my!! Combines the best of both worlds… YUM! Those are dessert, not breakfast, ha ha. What a delicious idea. Ummm wow. I have to make these sometime this week!! Oh girl (and Josh), this is a tease! This is a dream come true. I have never heard of anything like this before. THis makes my day. Printed and ready to be made. WOW. This should be sainted as the best breakfast in history! I can’t wait to make these!! Yum!!! These look so yummy! May have ti make them tomorrow! Oh my, these look dangerously delicious! My husband will love these! I used to live right around the corner from the Griddle Cafe a few years ago – wish I’d ventured to try these back then. Glad to have a recipe! I think I found a new food staple in my life. Love! I am totally making this after my next long run! I can’t think of a better way to reward myself! This is the perfect “reward” breakfast:) Enjoy! This is epic!! I’m not even kidding, I need to make these right now! This should become a weekend ritual…nothing better than waking up to the warm smell of cinnamon. I love taking pancakes to another level. I actually have some streusel saved from when I made coffee cake muffins. I was thinking of putting it on top of my oatmeal since that is usually my go to breakfast, but I may just top them over pancakes 🙂 I made a carrot cake pancake with cinnamon honey butter this morning, and I was so content with every single bite. i love cinnemon, i adore cinnemon, your recipe is a torture !! I’m so upset that I am just getting to read this post now as I really could have gone for a few of these yesterday on my day off. They look super super delish! These look so great. I never have thought of a streusel topped pancake. Ingenious! What a sweet victory for you two to recreate this sensational, innovative pancake on the first go. It really is a scrumptious looking recipe, and I can just imagine the crunchy, swoon-worthy flavor of the streusel topping. Well done! Oh my goodness… These pancakes are so wrong and so right all at the same time! Brilliant! Oh my I can’t even put into words how good these look, definitely drooling on this end. Can’t wait to try, my son is going to go wild over these pancakes. Two Peas and their Pod Griddle Heaven is now open! I am soooo glad I found your site! What awesome recipes! yes, definitely breakfast for dinner! These look so good! What a decadent, delicious breakfast! These pancakes are knocking my socks off! I’m so glad you two recreated them because now I can eat them too without having to visit the cafe. I love pancakes and cinnamon streusel so I’m sure these will be a hit. i’m feeling a little unstable after seeing this–it combines two of my utmost favorite things in life. i’m not often inspired to march right into the kitchen and make something, but this is doing it for me! I know exactly what you mean by “a one time a year treat”. I have a few extremely fattening breakfast recipes I love, but honestly I can only do them once a year or else I go up a jean size! This look like something I’d want to add to that list. Nom!! Streusel pancakes? This seriously is the best idea ever – they look amazing! I love being inspired by vacation meals too! I was so impressed with your post and recipe (and those photos!) that I made these for Brunch on Sunday. I swapped the flour for whole wheat flour and they came out fantastic. I made 6 pancakes but the amount of streusel mix wasn’t enough to top them like in your photo. Maybe that part of the recipe needs to be doubled? It was still very delicious! I am glad you liked the pancakes. The streusel was enough for us, but if you want more, of course double the recipe! These were so great! Seriously the best pancake I have ever had or made! But I agree with Raquelle, the streusel did not yield as much as it would take to cover the pancakes like the picture shows. But they were still very very delicious! Thanks for this recipe. Feel free to double the streusel if you wish! Yeah you must have used all the streusel for just one pancake! It wasn’t enough. But still yummy! These look heavenly. Breakfast tommorrow for sure! I hope the kids enjoy the pancakes! As stupid as it is to say: these pancakes are life changing. Really. we made these last night and had the leftovers for breakfast! They were super yummy. Time to go work out 😉 Thanks for posting this recipe! So glad you liked the pancakes! They are a real treat! I wanted to let you know that I made these pancakes for some guests and we were amazed! I made a cream cheese frosting/drizzle instead of the maple syrup and it was like eating the center of a cinnamon roll! I just did a blog post about it, they were so delicious! I recently started following your blog and I’m so happy that you shared this recipe. I love the drizzle idea! We will have to try that next time we make them. Those look like the sweetest, most delicious pancakes!! Thankyou guy for taking the time to recreate this recipe and sharing it with us! If I half the ingredients, do I use 1/4 tsp baking soda or 1/2 tsp? I noticed in the other pancake recipes for one cup of flour it calls for 1/4 tsp baking soda instead of 1/2tsp. Or does it really matter? I would try using 1/2 teaspoon since you are halving the other ingredients. Enjoy! Oh wow! I already make the same buttermilk pancake recipe but the cinnamon streusel sounds divine! I know what I’ll be making the next time my kids ask for pancakes. I made these this morning for Pancake Day!! They didn’t NEARLY as nice as yours but they tasted AMAZING! Happy Pancake Day! So happy you tried our pancakes and loved them!! I came across this while looking for something sweet to make. Awesome, awesome , awesome. Thanks for sharing this. I just made some up for My Brother and myself. Both of us agree these are good. Oh these are amazing! We love cinnamon anything at our house! I can not wait to try these! They look so delish!! Those pancakes look delicious. Will make some streusel at our bakery and try it on our buttermilk pancakes at the restaurants. These look delicious. Will use the muffin streusel from our bakery on the pancakes in the restaurants. Oh… man. I made these for breakfast this morning and I’ll be honest… these are potentially the best pancakes I have ever had. Thank you for this recipe! Hi Maria – I ran my first full marathon this past weekend. The next morning I was looking for something sinful to eat to celebrate my accomplishment. I’ve had these pancakes starred in my Google Reader forever, so I decided to make them finally. Hubby and I both thought they were delicious! Perfect post-marathon treat! Thanks for the great recipe! And congrats on Caleb – he’s adorable! i’ll try cinnamon streusel anything! OK, I just figured out what Im making for breakfast tomorrow for Christmas! I’m making these for dinner tomorrow night, we LOVE breakfast for dinner, I’m so excited! They look amazing, I’ll have to let you know how it goes! I hope you like them. They are one of our favorite breakfast treats! I made them! My husband’s reaction was “Wow, are you trying to kill me!” This will be on my recipe rotation from now on. But it is definitely a breakfast food, you need all day to digest them, I still felt full this morning 🙂 I’ll be blogging about them today, and linking back to you of course! The pancakes are very decadent:) Glad you liked them! Made these yesterday morning! They are SO decadent, just like Maria said. They don’t even need syrup on top… they’re perfect as is hot off the griddle or pan. 🙂 Everyone loved them and it made plenty for the four of us. I had these at my Mom’s house one morning. She got the recipe from here. They are extremely tasy. I’ve been thinking about them all day because they are on the menu this week. Quick question: You call for unsalted butter. I only use salted because I get it cheaper than unsalted. I’m wondering if there is a big difference in taste with salt verses unsalted in recipes? Could I just not add the salt called for in the recipe? I’ve been curious for a while now. Thanks! Really enjoy looking at your recipes. Hope to make more soon! You can use salted butter in this recipe. Enjoy! 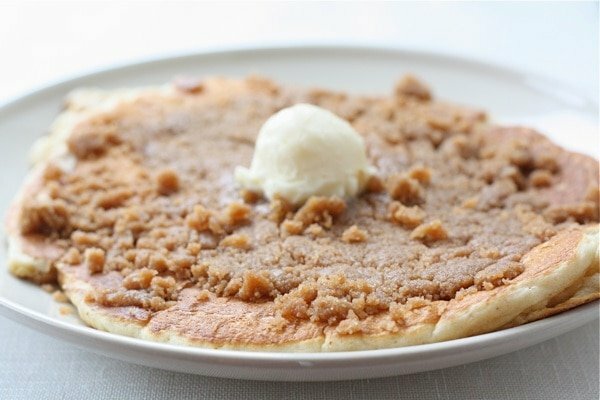 I think streusel on a pancake is a fabulous idea! I can’t wait to try this. Now that you mention it, I bet the streusel would be great on a lot of things… Muffins, cakes, waffles, Yum! Just made these for myself and my four kids. To say it was a huge hit would be the understatement of the year. Thanks for the great recipes!!!! Somehow I just saw this. Thanks for the link! Hope you are doing well! Oh wow, this recipe looks amazing! I’d make a big ol’ batch and have them for breakfast, lunch, and dinner! I’m so excited. I ate at the griddle cafe a few years ago and couldn’t believe how good it was. I wanted to take my family there and had forgotten the name. The minute I read your post, I knew it was the same place. YEAH! Thank you so much! Now to try and make these fabulous pancakes. We LOVE Griddle Cafe. I need to go back! It is so good! I hope you enjoy the pancakes! We’ve now made this recipe about 20 times 🙂 We’ve made it for company 3 times and my husband requests it at least 1x a month. My husband wasn’t a fan of breakfast, but he has since changed his mind! Well he likes breakfast… but wants to eat cold cereal…bleh! You guys are fantastic. I like making them with powdered eggs and fresh ground wheat. Home ground wheat always tastes so much fresher and doesn’t spoil as quickly. Yum! Glad you are enjoying the pancakes! OH. MAN. Just made these this morning – soooooo good!! They definitely did not need syrup though, just a bunch of butter to soften up the streusel. But boy oh boy were they tasty – like flat coffee cake! Pingback: Cinnamon Streusel Pancakes « Tales from a 20-Something's Kitchen. Is there anything you can substitute for the buttermilk? I have never wanted a pancake so bad in my entire LIFE!!! WOW…wish I had buttermilk today. Thank you for the idea! I was looking for a way to change up our usual Sunday morning pancake breakfast. Delicious!! Just made these. Holy jumpins there are good. Thank you. Wow! 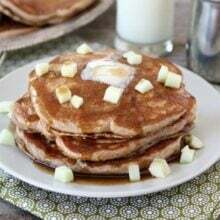 I’ve been looking for a griddle pancake recipe like this since my husband and I had the best pancakes in the world at The Griddle Cafe in LA in 2012. They came out amazing! I modified banana pancakes instead and added puréed bananas and added sliced bananas to the pancakes before I flipped them. My kids told me these were the best pancakes they’ve ever had! Thank you!